InfoUtil simplifies processing of your high-intensity business data at top speed and low cost. Our technology provides full data availability, reduces competition for mainframe resources with zero impact to your systems or users. Make the most of your existing mainframe investments with software that’s compatible with and complementary to IBM native utilities and syntax. InfoUtil is comprised of two products that can run either independently or together. They radically speed up daily Db2 utility tasks using fewer resources than native Db2 or counterpart utility software. Accelerate your data management 10x faster than native Db2 utilities with parallel processing architecture. Provide high performance and high-speed throughput using minimum CPU and I/O. Applications maintain constant, uninterrupted read/write access to data during load and unload. Integrated innovative techniques enable you to handle extensive and granular data selection, conversion and transfer. Export data faster than any other Db2 utility, while maintaining high availability and performing the data conversion required for your business applications. Unload Db2 data without removing objects from RW. 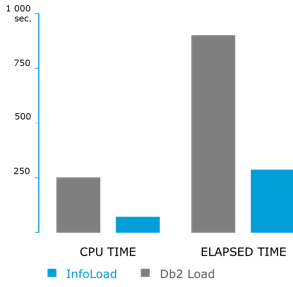 InfoLoad is a comprehensive and powerful alternative to the native Db2 utility. 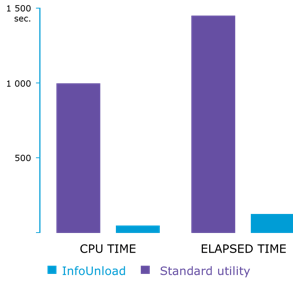 By working outside Db2 and with parallel processing, InfoLoad significantly reduces the CPU and elapsed times required to import data.